Note: As this is Sangat Program, everyone is invited. Please feel free to share this information. 9.00AM Shabad Chowki (like a Prabhat Pheri) will be taken to circle around Villa. 9.15AM Kirtan/Poems/Special performances by Kids will start in the hall and continue uninterrupted. 10.10AM Judges will Judge Group-A Dastaar Bandi participants. 10.35AM Judges will Judge Group-B Dastaar Bandi participants. 12.45PM Special Skit by Kids. 1.15 PM Prize Distribution for Dastaar Bandi Winners. There are special prizes for all participants as well. 1. 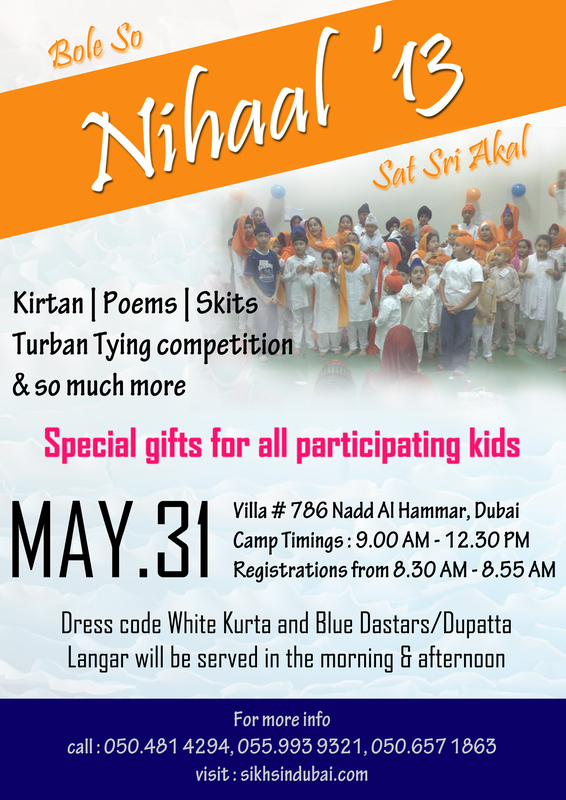 The purpose of this camp is to MOTIVATE and INCULCATE our Kids towards GURMAT in a FUN way. This can be achieved by maintaining discipline. So Kindly, ensure to be on time so that kids can thoroughly enjoy the Camp. 2. As part of discipline- Dress Code needs to be followed. White Kurta/Suit with Navy Blue Dastaar/ Chunni. 3. All Kids- irrespective of gender can participate in Dastaar Bandi Competition. Turban needs to be brought from home. Turban Color-navy Blue or Black dastaar only. All Sangat is invited to reach and have lahaaaaa!!! !